I’m happy to announce I’ve moved back west to Colorado – especially since Boston and Wellesley, Massachusetts have experienced such record amounts of snowfall! 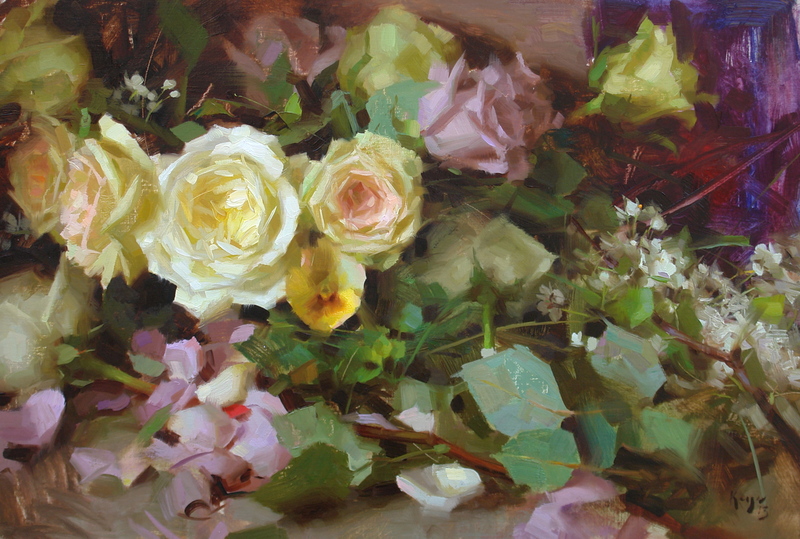 Speaking of records, in case you’re not aware, Richard Schmid’s painting, “Yellow Roses” oil 20” x 30” sold for $187,200, setting a world record at the 2014 Jackson Hole Art Auction in Jackson Hole, Wyoming last autumn. If you’re like me, I can’t wait for spring to reappear in earnest and with it comes the desire to re-hang my paintings in the new home I’m building in Colorado Springs. I miss seeing my collection of oils by Richard Schmid, Nancy Guzik, Clyde Aspevig, Carol Guzman, Judy Stach and paintings by my late husband, Timothy R Thies as well as works by George Carlson! http://www.WestWindFineart.com and click on the artists pages. I’m also writing to let you know Richard celebrated his 80th Birthday in October 2014. His wife Nancy sent out a global birthday card request and consequently, he received over 5000 letters and cards from collectors, artists, and fans from thirty-seven countries around the world! Richard is doing quite well, he is working on two new projects and will be returning to his easel in the coming months. I myself am in the process of writing a new volume celebrating Richard’s Art and many accomplishments. No doubt he is one of the world’s foremost living artists, educators, and philanthropists, and according to Steve Doherty, one of the most influential artists of our time. 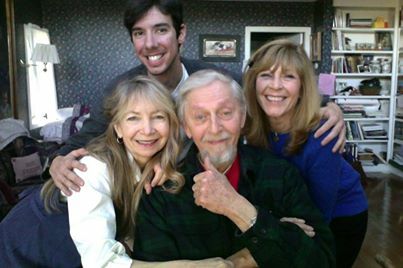 But, I‘m also compelled to share the untold story and photos of my remarkable friendship with he and his wife Nancy Guzik over the past 17 years. 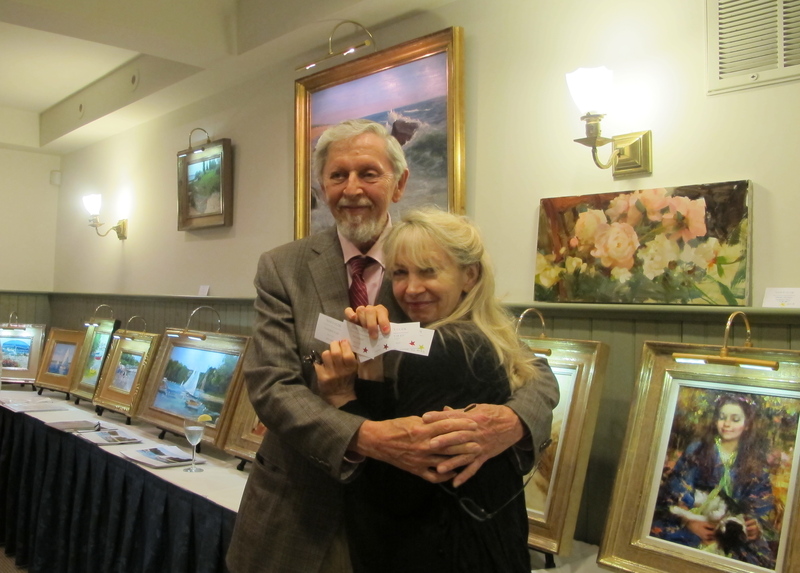 I’ve also included a few photos from our highly successful show in Boston. 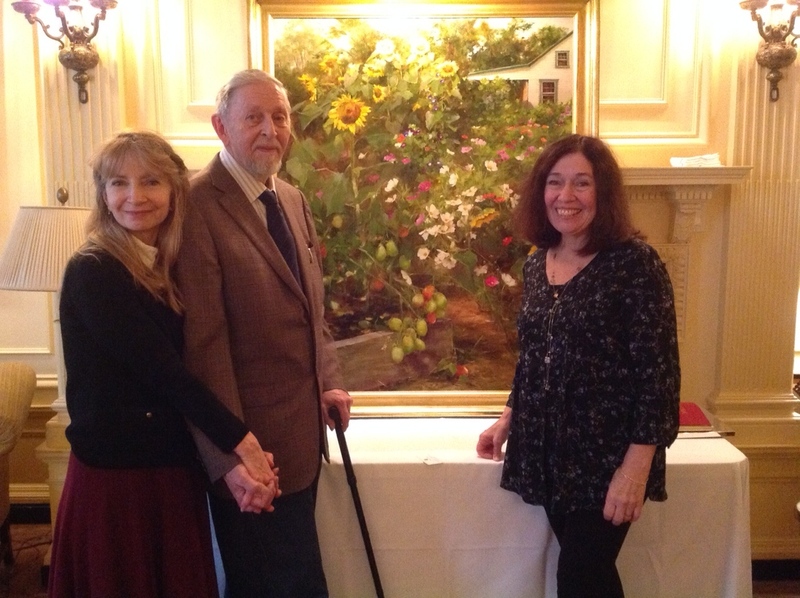 Nancy Guzik, Richard Schmid with Kathy Anderson and her oil painting, at our autumn show at the St. Botolph Club. 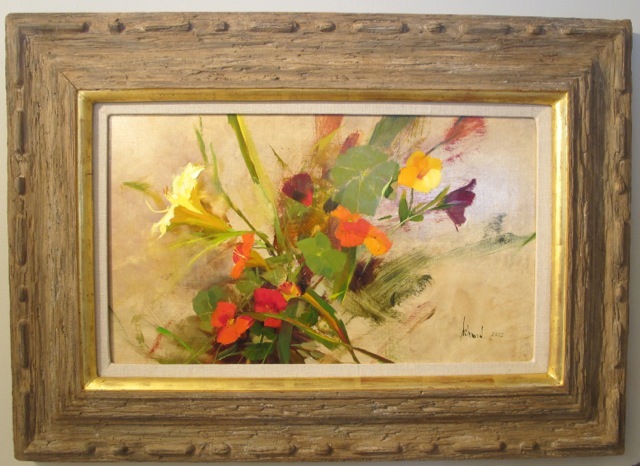 Late winter is a perfect time to celebrate the joys of life and the beauty of Fine Art. Please give me a call if you wish to add a new special piece to your collection. Next month, I’ll feature Clyde Aspevig’s solo show, Nature & Nuance at the Booth Museum in Cartersville, GA. For more info. visit http://www.boothmuseum.org. The long, warm, and sometimes sultry days of summer are winding down, and herald the excitement of a new season. In New England, autumn unfolds as a glorious array of stunning colors and conjures thoughts of apple pie and clear, crisp days and piles of autumn leaves. Featured in Southwest Art’s September 2014 issue, “Making Magic: Painter Nancy Guzik sprinkles fairy dust and beauty into her art by Gussie Fauntleroy. 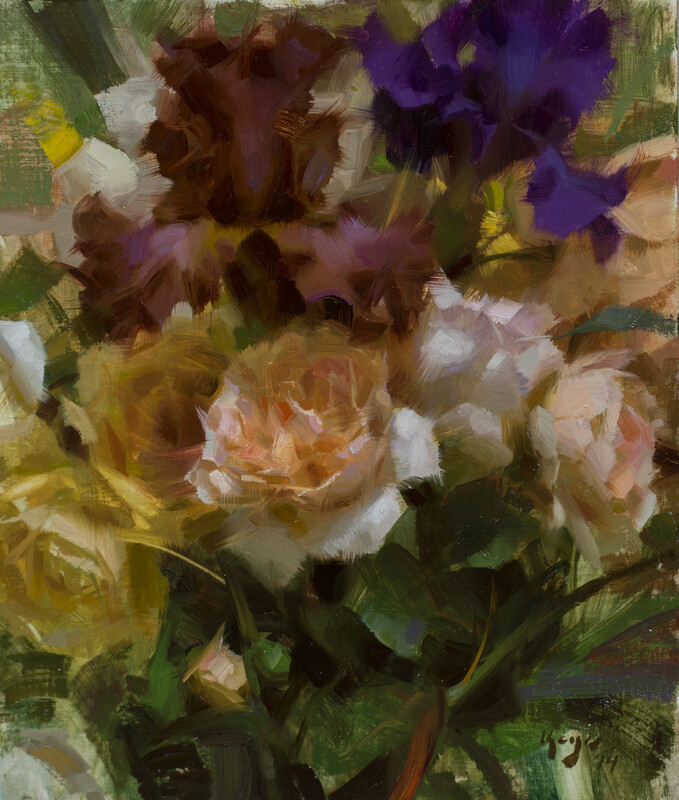 It is with great pleasure that we dreamers and artists offer up new paintings – moments captured in oils to express color harmony, the delights of enduring friendship and love, and exuberant garden flowers. 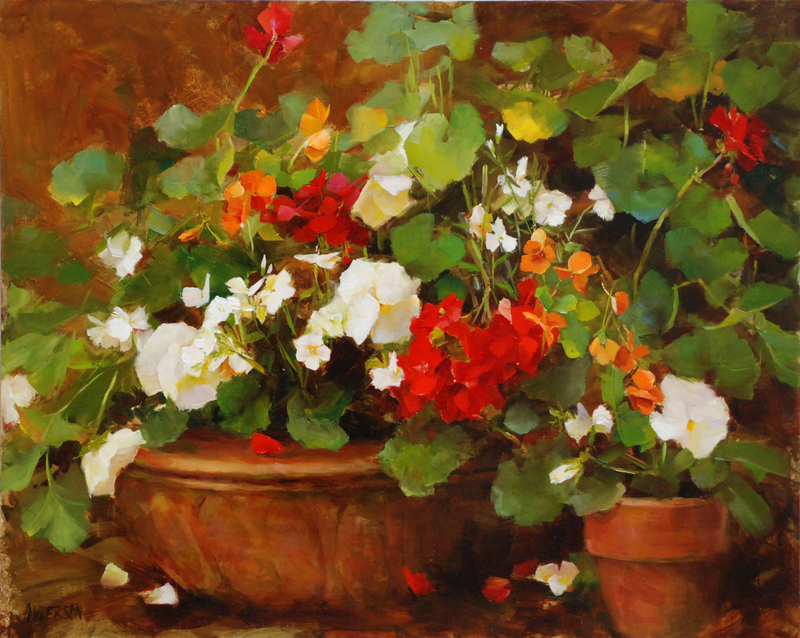 “Geranium Harmony” ©KATHY ANDERSON 2014. 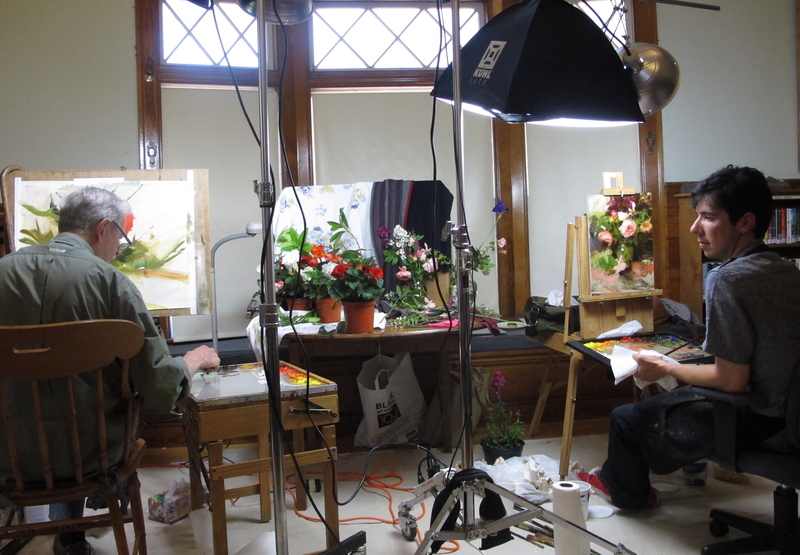 Featured on her new best selling instructional DVD “ How to Paint Flowers in the Studio” from Liliedahl Art Video. All three artists will be present to personally autograph books and our new Exhibition Catalog after the film. (Please note autographed copies may only be purchased at the show). 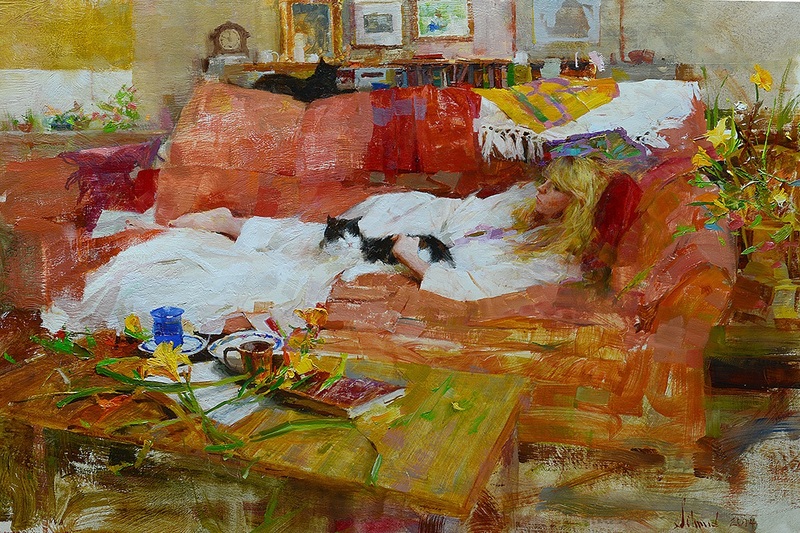 Autumn 2014 also marks Richard Schmid’s 80th birthday and West Wind Fine Art’s 16th anniversary. We happily invite you to join Richard, Nancy Guzik, Kathy Anderson, and myself in our celebration of creativity, friendship, and life. 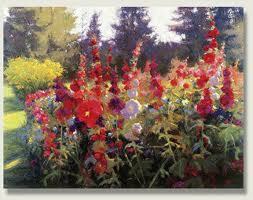 I know you’ll be caught up by the beauty and magic of their exquisite paintings! For details please visit www.WestWindFineArt.com. The artists retain copyrights to their paintings worldwide. Today I’m excited to announce our 15th Anniversary Show June 21-23, 2013. It also marks a turning point–a time to reflect on my life with my late husband Timothy who passed away three years ago. But 2013 also marks the beginning of springtime with the promise of a new, wonder-filled year which is filling up with many exciting adventures. But just in case you’re not aware, my Irish Terrier Lilly and I moved to a beautiful new home on Morse’s Pond in Wellesley, MA in 2012. And, this new Blog site has had more than 10,000 views. Plus the short documentary film I produced titled, “Richard Schmid’s Journey to Abbotsford- the home of Sir Walter Scott.” for West Wind Fine Art’s YouTube Channel, has been seen by more than 5000 people world wide! I also assisted Nancy Guzik in producing her adorable video, “Where Fairy Tales Come Alive.” http://www.youtube.com/watch?v=iq4Jw6Xiy_E It is the first of many films that will give artists and non artists an exclusive behind the scenes look of Nancy painting children directly from life. I was recently asked for a quote about our 15th Anniversary Show… All I can think of is this: It’s a privilege and my joy to promote excellence in Fine Art. As much as I miss Timothy, I know he is in a wondrous place. And, I also know he would be proud that I’m carrying on the adventure we began together in 1998. All images are strictly copyrighted by the artists and may not be reproduced without their express written permission. I’m delighted to share a brand new video by my dear friend, artist extraordinaire, Nancy Guzik. Its always a joy to collaborate with her because together, we allow ourselves to enter the realm of pure creativity, joy and wonder. I also want to give a shout out to artist Ryan Mellody for his expertise in the making of this little gem. Like me, Nancy is a perfectionist and although the little film isn’t very long, it represents her countless hours of dedication to excellence in the arts. As I reflect on the recent tragedy in CT, I feel a true calling to help uplift our spirits by focusing on the joys of life. So, I’m beginning to plan new events and videos that I believe will inspire you in 2013! This blog brought to you by www.WestWindFineArt.com. Curating Fine Art Collections since 1998. 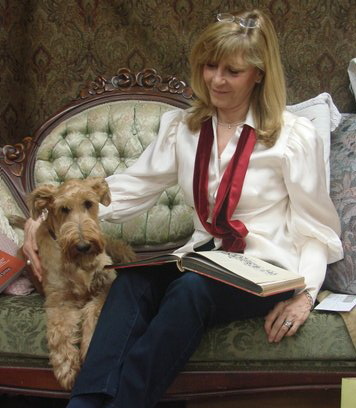 My Irish Terrier, Lilly and I were invited to pose for the Putney Painters at the Village Arts of Putney, Vermont on October 27. It was a lot of fun and everyone loved painting Lilly – she was a wonderful model – better than me because she didn’t move as much. Ryan Mellody, a member of the Putney Painters timed each pose which lasted 25 minutes with a 5 minute break in between. During one of the breaks Richard Schmid told me that even experienced models shift positions involuntarily. I can attest that sitting still isn’t easy for an active person like myself. We began at 10:00 am and ended at 4:00 pm with a one hour lunch period. 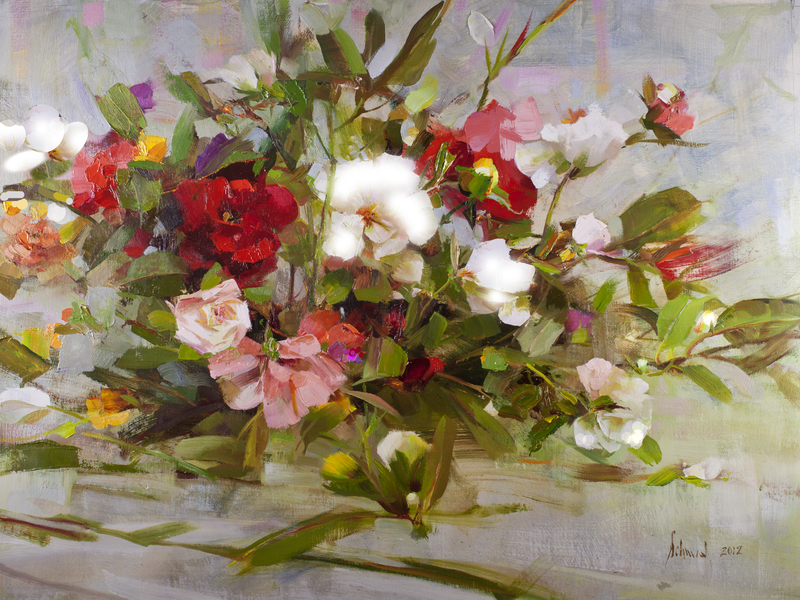 THE PUTNEY PAINTERS founded by Richard Schmid and Nancy Guzik in 1999 is becoming famous as one of the finest painting groups in America. 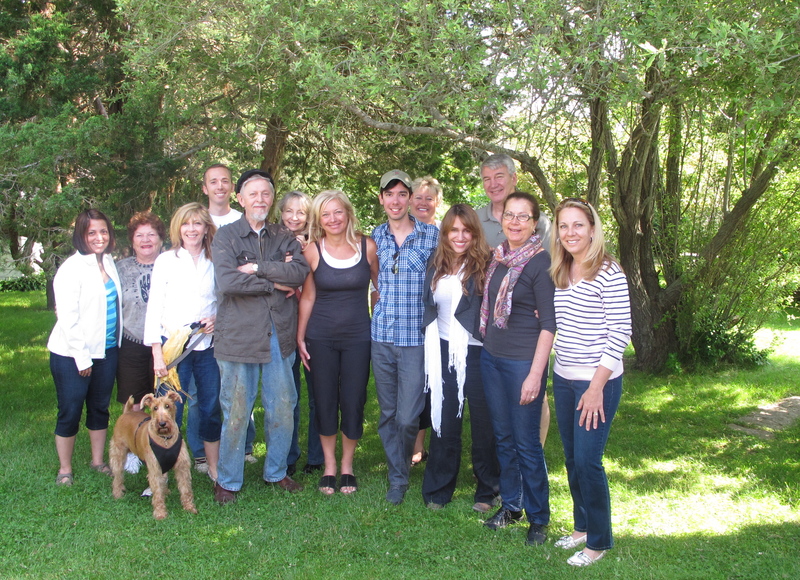 The group is made up of serious artists invited into the group by the founders. 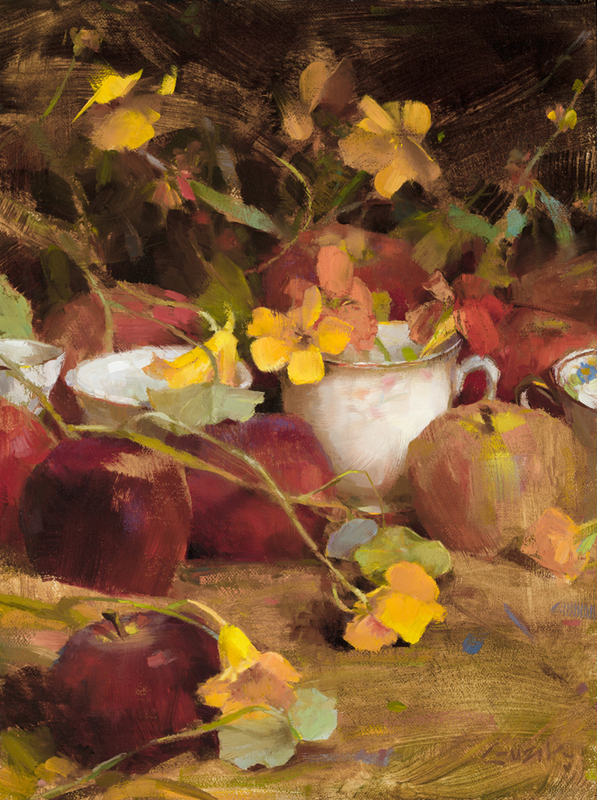 Many of the Putney artists are scheduled to teach workshops at The Scottsdale Artists School in January 2013. 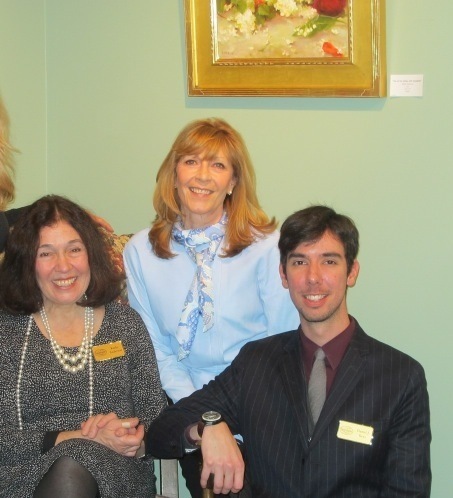 Putney Painters Week begins January 28 – February 2, 2013. Sheryll and I are also donating all ticket sales for our digital lecture to the school. For exact details and to register, please contact Audrey Lemler at ALemler@ScottsdaleArtSchool.org. 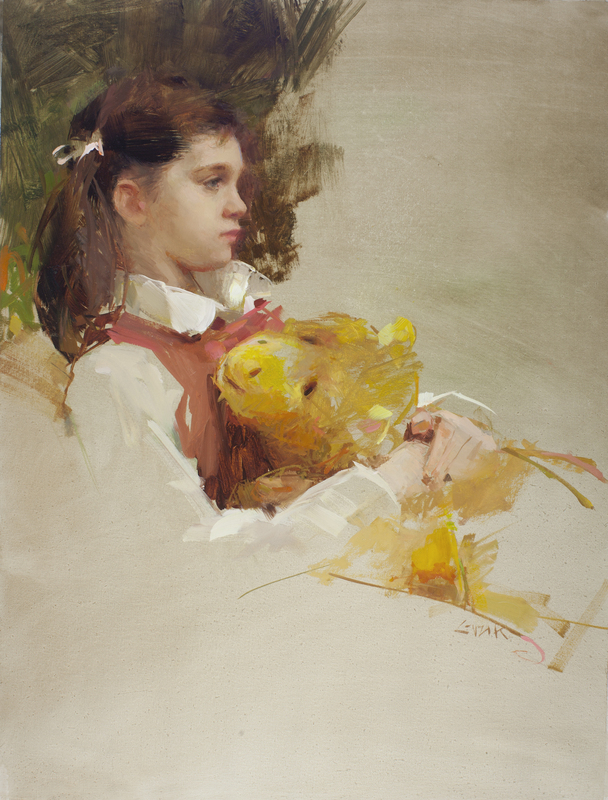 This blog brought to you by www.WestWindFineArt.com, curating Fine Art Collections since 1998. The summer of 2012 was ideal! I can not recall a season that was more fun, informative, and filled with creative camaraderie! 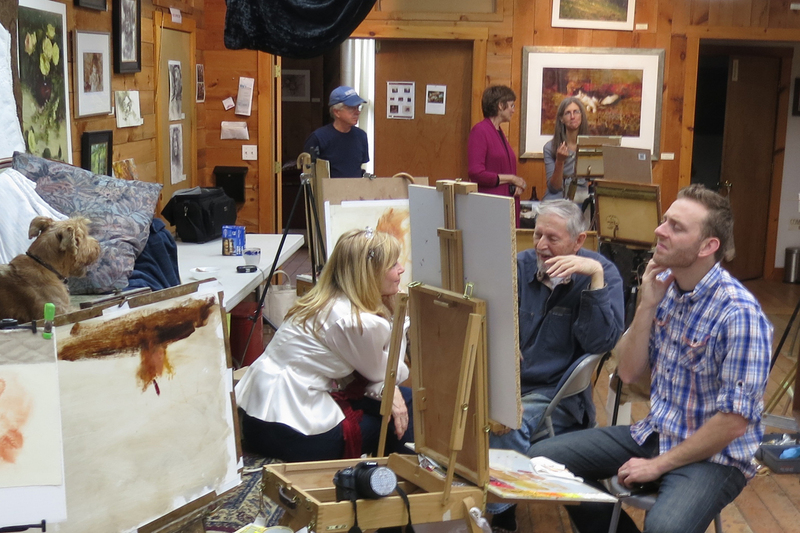 In June, my company West Wind Fine Art, LLC sponsored a painting demonstration by Richard Schmid and Daniel J. Keys at the West Falmouth Library on Cape Cod. Then Daniel did two back to back painting workshops sponsored by my colleague Sheryll Reichwein and her artist husband, Douglas, at the Beach Rose Inn. 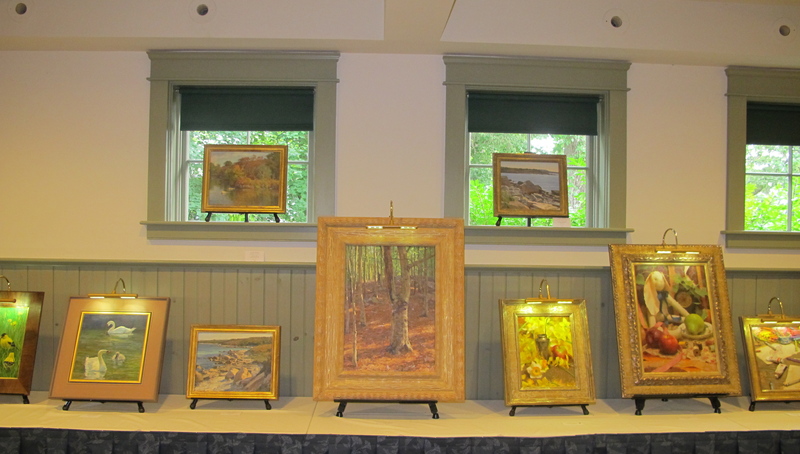 Both events sold out in a matter of a week and were extremely well received by artists in the New England area. Consequently, more events are definitely being planned for next year. July 6th to 8th were even more special! 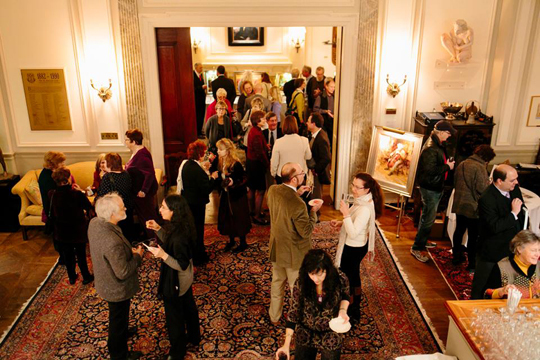 I was so fortunate to host an amazing Fine Art show – A Return to Understated Elegance at The J. Erik Jonsson Woods Hole Center owned by the National Academy of Sciences. And, on the evening of the 8th, Richard Schmid gave an inspiring digital presentation to a packed audience. Collectors traveled to attend Richard’s program and view the paintings and sculpture in the show from all around America. So, I’m really pleased to state that my mission to spread joy through Fine Art is definitely on a roll. 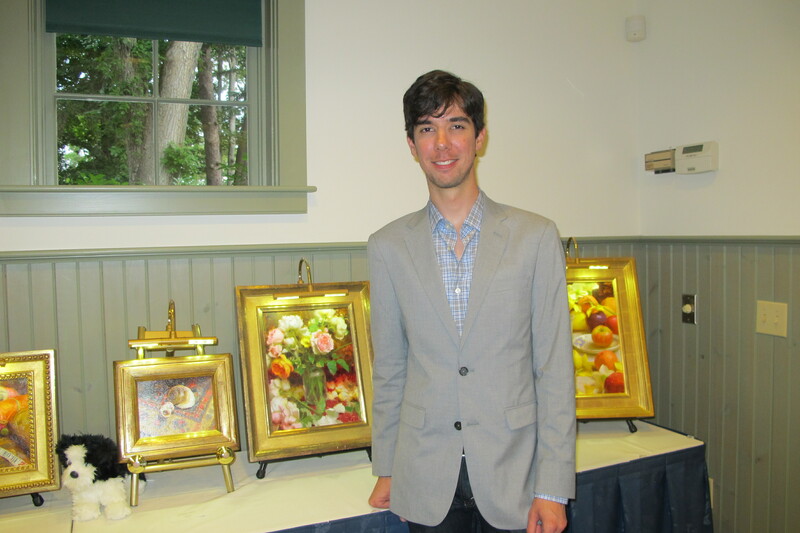 Daniel Keys with a few of his paintings in the show. Photo © Kristen Thies 2012. 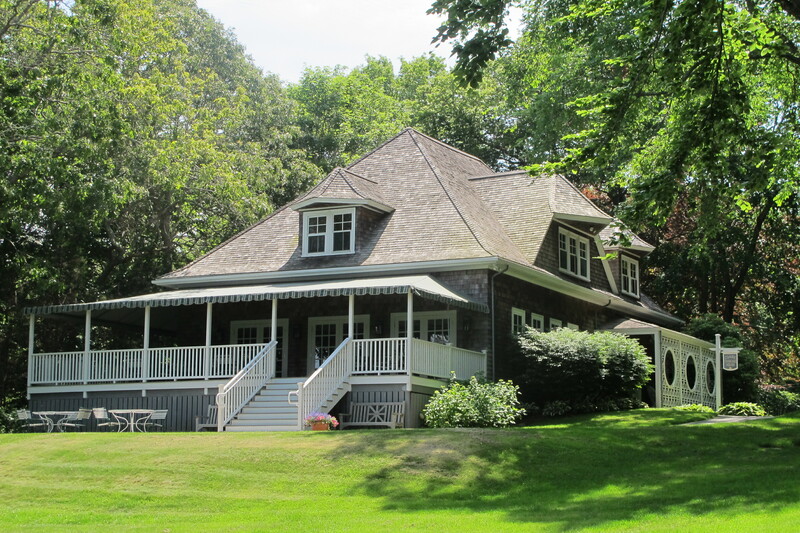 On a personal note, I want to express my gratitude to the managers of the Jonsson Center, Joanne Doherty, Donnie Elichalt and their assistant Ruane for their professional expertise in helping to make everyone feel so welcomed to one of the most beautiful and historic places on the Cape. The Clark Carriage House circa 1894 – our show venue. Photo © Kristen Thies 2012. 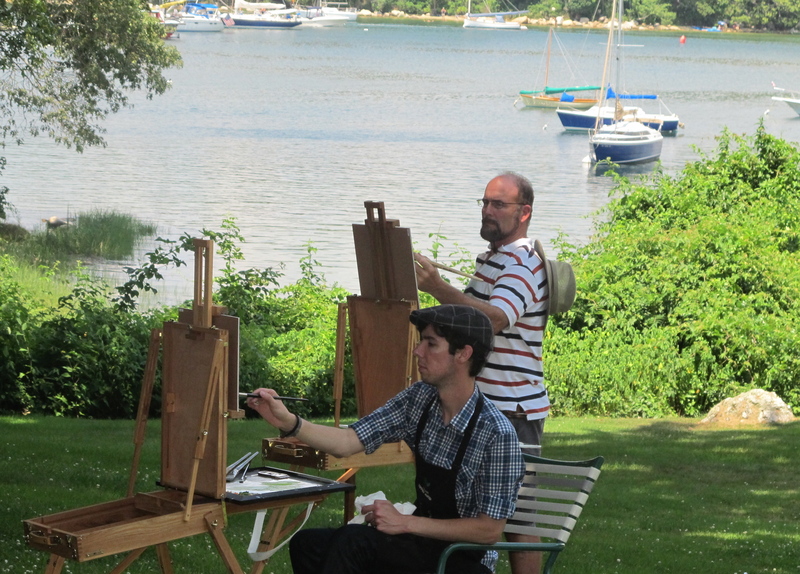 Daniel Keys and Douglas Reichwein painting on the JC grounds facing Quissett Harbor. Photo © Kristen Thies 2012. This blog brought to you by www.WestWindFineArt.com,curating Fine Art Collections since 1998.